Vendee is on the northern part of the west coast of France, south of Brittany, Nantes and the Loire Valley. Its main city is La Roche-sur-Yon, a fairly mundane mid-size town away from the coast. My great uncle Victor (Dad's uncle...) was an horologist of some fame and I loved spending the night there, as all the clocks he had in his care for repairs or sale, would all go off at slightly different times - some of them being old country full carillions - making the night an interesting symphony of chimes. You would have gathered by now that this is where my Dad's family comes from: Anjou and Vendee. 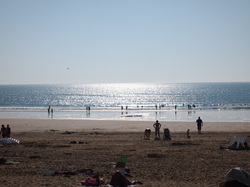 I will try to let you discover some of the main attractions of the coast, called "Cote de Lumiere", namely for the time being, Les Sables d'Olonne, a fairly popular resort town, and home to a lot of retirees (including my sister...) and week-end temporary visitors and inabitants. The second one will be the island of Noirmoutier, two hours drive north of Les Sables. Originally, a very active fishing port with its own canneries mainly for sardines and whales, with its sister city of La Chaume across the channel leading to the sea, now both destinations rendered popular with the introduction of the "conges payes", what we call - and take for granted - annual leave and the fashion for going sun bathing on one of the most beautiful and large sand beaches. It has a beautiful church, Notre Dame de Bon Port, and both a covered market next to it, and a fish market on the harbour. The old village of Les Sables sits on the Remblai, in between the beach and the Harbour, where my sister lives. The "Remblai" means the Dam and was built to protect the harbour from the often crazy and temperamental seas. You may recall seeing on the telly last year evidence of its fury, when most of the place was taken away by an unusually strong storm. The beach at Les Sables has not recovered yet, but most of the damage to roads and buildings have now being fixed. Here are a few photos taken over my last visit in October 2010. Mum is putting on a brave face over my visit, but from time to time, grief takes over. Fortunately, the weather is gorgeous for most of my stay and we can go exploring the various villages and beaches along the coast, and obviously visiting or revisiting the good restaurants that we like to frequent on the way. The "cherry on the cake" so to speak will be on my last day at La Cayola, a few kilometers south of Les sables, arguably the best restaurant 50kms around. My cousin and her husband were kind enough to drive from Niort (about 120kms south) to share our lunch. Hopefully, there will be a few more years to share these beautiful places with Mum who will be turning 92 in March. Below, I will share some of these moments in pictures with you. And I had not been back since. So in October 2010, my sister took me away from our paternal duties for a pilgrimage back to our childhood, and what was for me the very beginning of adolescence. We probably spent two months there with Mum and Dad came to be with us later when he could get away from work, having suffered a major car accident on the way, fortunately with only a few broken ribs and a wrecked car. We ended up spending the whole school summer break there, which was really a great treat. My uncle drove us back to Tours where we lived eventually in his brand new Peugeot 203, the top of the range at the time (My uncle always had a 'top of the range" car, having a very succesful business in typewriters and calculators in Niort, which he still runs (at 85...), although now selling only office furniture). The Noirmoutier island sits about 90mn drive north of Les Sables and is now accessible via a bridge on the southern tip on the island. Back then, you had to wait fot the sea to be at low tide, revealing the submerged road called the Gois and allowing passage for a few hours twice a day. There is also an original architecture, that is commom to all the islands on that coast: Ile d'Yeu, Ile de Re and Ile d'Oleron being the most famous of them, and which is used by fishermen and farmers alike. A traditional "maison de pecheur"
Noirmoutier is also very famous for being home to the most expensive potatoes in the world. Known as "La Bonnotte", only around 100 tons of this top quality potato are cultivated annually and it is harvested only on the island Noirmoutier. The cost of one kilogram can reach $500, but the potatoes are normally sold for around $100. The cost is attributed to the fact that this type of potato is almost extinct because it must be harvested by hand. The potato fields also require fertilization by seaweed in a climate shaped by the nearby sea. The presence of algae and seaweed in the soil is responsible for the potato's earthy and salty flavor. Because the variety is delicate and its tuber remains attached to its stem, the potato must be picked and not torn. The potatoes are generally served in top class restaurants in France and the Netherlands in mid May. The island and the coast near by are also home of a number of "marais salants" - salt marshes, a maze of shallow seawater reservoirs where the sea salt is harvested during summer. Further north of Nantes sits one one most famous salt harvesting area in Guerande. Gerande "fleur de sel' is famous around the world and used by all the celebrity chefs.